Carmelo Anthony will soon make headlines once again – not with his super basketball plays but with his new signature shoe. Jordan Brand announced that the ninth signature shoe of Anthony called the Jordan Melo M9 will be rolled out before Christmas Day. 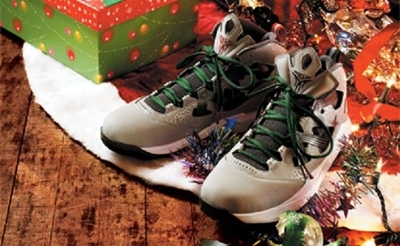 The Jordan Melo M9 “Christmas” will be released on December 24 – Monday. The spanking new silhouette features a visible Zoom Unit and Flywire on the upper part to produce the lightest Melo signature kick to date. This brand new Melo model is expected to get a lot of attention so make sure to grab one immediately and watch out for more colorways soon!